Have catering needs? We have a custom solution for you! Learn More about our service offerings today! We not only deliver your food we provide peace of mind. At Chef’s Catering, our culinary team prides ourselves on developing customized menus to create your perfect event. Chef’s Catering of Upstate New York provides a great solution for individuals and corporate event catering needs. Chef’s provides an ever-changing menu of fresh, gourmet meals that are sure to please every palate. By focusing on the consumer’s needs, Chef’s not only focuses on traditional meals, but offers a variety of cuisines including, but not limited to; healthy, gluten-free, Mexican, Italian, American, vegetarian, and more... Chef’s catering menu includes American favorites on from the food truck, focusing on gourmet sliders, to healthy boxed lunches for corporate caterings, all the way to five star, gourmet fares for weddings, including plating, buffet, and on-site chefs. Chef’s has the ability to travel and create freshly prepared menu items with their top of the line food trailer and food truck. Two mobile kitchens guarantee customer satisfaction due to increased quality of food preparation at on-site events. Voted RBJ Best Caterer in Rochester 2018! We'd love to help with your corporate event! 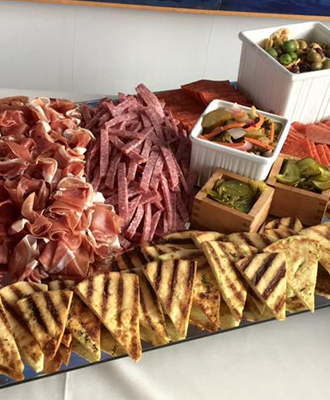 We'd love to help you with our wedding catering services! We'd love to help with your rehearsal! We'd love to help with your cocktail party! We'd love to help with your drop off catering needs! We'd love to help with your holiday party! Looking for us to cook on site? Thinking about having a food truck at your event? We have fully mobile solutions for you! Let's discuss your options today! Looking for a menu sampling? Take a look at some sample menus below! Amazing, amazing, AMAZING! So many compliments!! Your wait staff was so wonderful! The bartenders were phenomenal! I got in a fight with 3 of my friends over the green bean casserole because we all wanted to take it home. I literally cannot thank you enough for the wonderful job everyone did! THANK YOU!!!! Amazing, amazing, AMAZING! So many compliments!! Your wait staff was so wonderful! The bartenders were phenomenal! I got in a ..
From the beginning Chef’s Catering was the most accommodating vendor we had for our wedding. Chef’s Catering didn’t have the normal buffet style food, from the salad with a twist to the pasta station made how you wanted it, to cooking the food on site at Sonnenberg Gardens made it much more appealing to all of our guest. Everyone commented on how different and good the food was to the normal buffet food. No one except myself knew that Chef’s Catering (Mike) took full control to make sure everything went smooth. ..
From the beginning Chef’s Catering was the most accommodating vendor we had for our wedding. Chef’s Catering didn’t have the .. I just wanted to thank you and your associate for making our reunion such a huge success. Everyone commented on how good the food was; both of your positive and easy going attitudes. Your both were extremely polite and friendly. You were on time and that’s all that mattered. I’m sorry that I should have sent you a map of the park and directions. We appreciated all the effort that you did to make it special. I would indeed recommend you to anyone and if we ever have another big event, I would easily ask for your services. .. I just wanted to thank you and your associate for making our reunion such a huge success. Everyone commented on ..
We wanted a very special luncheon for my daughter-in-law’s baby shower, and Mike Zazzaro, Chef’s Catering, did a wonderful and professional job for us. He listened to our needs, made great suggestions and personalized the menu to our preferences. The food was not only spectacular, but elegantly served on silver platters. All of our guests, the aunts, cousins, friends of the mommy-to-be, raved about how delicious everything was. Thank you so much, Mike! 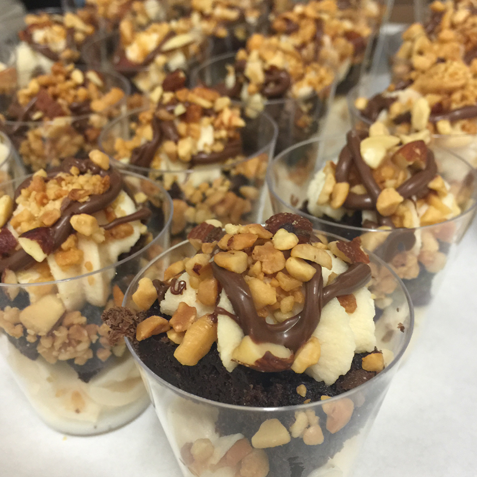 We wouldn’t hesitate to use Chef’s Catering again, and would highly recommend you to our friends. ..
We wanted a very special luncheon for my daughter-in-law’s baby shower, and Mike Zazzaro, Chef’s Catering, did a wonderful and .. Chef's Catering creatively put together my sister's baby shower. They catered a full service brunch from 11-2. While planning the shower, we discussed our vision for the shower and Mike made it a reality! We wanted French toast and pancakes and ended up with silver dollar pancakes and a French toast casserole (which guests begged for the recipe). We also ate scrambled eggs, bacon, sausage, and rosemary roasted potatoes. Our guests were ecstatic about having such a satisfying brunch! Chef's Catering showed up an hour before the event and arrived before the end to clean up and pack their van. .. Chef's Catering creatively put together my sister's baby shower. They catered a full service brunch from 11-2. While planning the ..